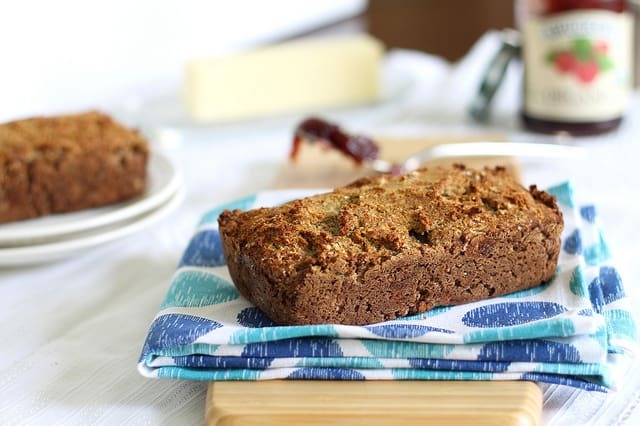 This paleo almond coconut banana bread is incredibly moist and just slightly sweet without any traditional flours or sweetener. I didn’t title it as such, but this is a paleo bread. At least I think it is. Can we discuss this whole paleo thing for a moment? So, the premise is to eat “like a caveman would”. Ok, I get that. But I have a really hard time distinguishing between eating the foods a caveman would’ve been able to eat versus the methods a caveman would’ve had at his disposal. Baking just seems completely counterintuitive to the whole paleo thing. I mean, did cavemen have ovens? Baking soda? No. And then there’s the whole bean thing. Beans were definitely around back then, why aren’t they included on the “ok” list? So, no beans, but bread’s ok.
Um, I can’t be the only one confused by this. And let me just disclose that I’m totally no paleo expert (as if that weren’t already apparent). I’ve done a bit of online browsing and read a decent amount of other people’s posts on the diet. That’s it. What I’ve basically realized after wasting my time reading far too many articles about it is that maple syrup falls in the (quite large) gray area. This bread has a tablespoon of it. I’ll leave the determination up to you. I had no intention of specifically making a paleo bread, I just wanted a higher protein one with no traditional flours or sweetener. Had I judged the outcome based on what the dough looked like, this would’ve been inedible. The dough was incredibly thick and I didn’t think there was any way it would rise at all or turn out to be anything other than rock hard. I was totally wrong. One of the few times in life I’m happy about that. It’s just perfectly sweet enough from the banana and it’s so incredibly moist. If I could describe my perfect bread texture, this would be it. Maybe those cavemen were on to something. You know, with their ovens and all. But not that jelly! That’s just me being controversial. Preheat oven to 350 degrees. Grease 2 small loaf pans (5 3/4" x 3 1/2"). Combine wet ingredients in a small bowl and whisk together. Pour wet into dry ingredients and mix until fully incorporated. Divide evenly (dough will be thick) into loaf pans and smooth the tops. Remove loaves from oven, let cool in pans for 5 minutes and then transfer to a wire rack to continue cooling. I know, it kinda made me cringe while doing it and I ended up using up the last of my bag. BUT! I had a ton of whole almonds on hand, ground them up really fine in the food processor and made my own almond flour. I used it in cookies yesterday and it worked fine! Much cheaper than buying the bags of almond flour with hardly anything in them. I never understood the paleo thing. I’m not going to knock it cause I don’t know enough about it but I just don’t think I could ever cut out some of the stuff you have to cut out. Jason’s old roommate did it and he was Asian and couldn’t stand not having rice after about 2 weeks so he quit haha..I really love your continual use of coconut flour..and almond flour! That’s so interesting. You find the most interesting flour. I love how moist banana makes breads..it’s so perfect! If I went 100% paleo, my family would make me sleep outside. They’d have no idea what to do with me. They already think that just because I don’t care for meat and love veggies, that I’m some weird alien. It’s a total lifestyle, not just a diet… so it’s a tough one, for sure! I haven’t tried coconut flour yet, I need too! This looks delicious! Sounds/looks delicious! I can’t wait to try it, as banana bread is currently having a moment in my life right now. I’m not sure where I stand on the paleo diet. I think aspects of it are great, but it seems like so.much.effort. With too many ‘rules’ to keep track of. Bring this bread to my house NOW!! I’ll bring some in June! Hopefully not the same loaf! I don’t really understand the whole paleo diet either but it’s fair to say that I haven’t made much effort to try either as as soon as there are foods which are ‘banned’, I can’t think about eating anything other than them. It definitely doesn’t mean, however, that there’s not room in all of our diets for tasty and healthy snacks like this. It looks like it has such a great texture and I love the use of almond and coconut flours. cavemen are extinct for a reason. evolution is good and inevitable. i love wheat bread. that is all. Gina – bread looks delicious. love how a banana can make the bread just right. Ummmm Cat….you do know that Cavemen didn’t become extinct…they evolved. That’s where we came from. As Cassandra said, caveman didn’t become extinct, they invented things and became, well, us. I’m a paleo dieter and it changed my life. The idea is that you don’t consume anything that didn’t exist before the agricultural revolution. Grains are in that category and are the main reason behind today’s obesity epidemic and the diseases that are associated with it. Our bodies have not adapted in the relatively short amount of time to process carbohydrates from grains. Evolution doesn’t work that fast. BTW, the paleo bread is great. I worked both with coconut and almond flour before and it takes practice. Coconut flour is very dense in fiber and you will need extra moisture to compensate otherwise your recipe will be dry. Cavemen aren’t extinct because they didn’t eat wheat bread. And it’s all actually all down to the fact that our digestive tracts haven’t evolved. Wheat, among other grains, is a cheap, low-nutrient source of energy. That is all. To me, any sort of diet is weird… Especially TV dinner diets. How can that be better than eating real food? This bread is great, my favorite part is the zero sugar in it! Well, almost! Yummy! I love using natural sweetners like maple syrup or honey in recipes. I feel less guilty when I eat the whole batch or loaf in this case. Great recipe!!! I have to look up the Paleo lifestyle, I don’t know much about it. Have a great day! haha you know I’m into the paleo thing, but no need to defend it when this bread fits into the lifestyle and looks amazing! 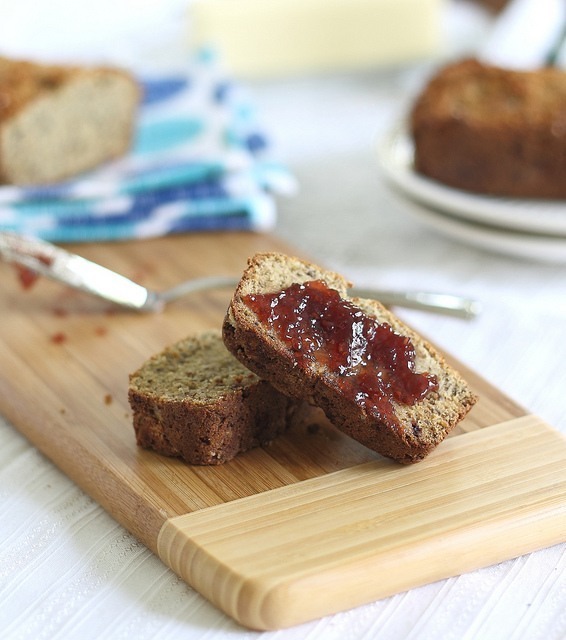 Grain free breads are not easy to make and this sounds like it came out awesome! I agree that the whole paleo thing is confusing…lots of people throwing that term around these days. I made a …also surprisingly…yummy spelt banana bread with no sugar on the weekend that I am going to post about soon. I was tweeting yesterday about not understanding paleo either. No beans or potatoes? Weren’t those around? And surely cave men weren’t eating lettuce wraps with taco meat and pico de gallo… right? If so, those were some fancy cavemen! I don’t care about any of the other info other than knowing it’s incredibly moist. Bread, especially banana bread! is just downright horrible and not worth eating if it’s dry. I think the flax, coconut two ways, and almond meal help. I haven’t made it in years, but I have a vegan GF banana bread (also uses PB) but it uses those things you used, too, and it’s so dense and moist! I’m a firm believer that anything with coconut flour is delicious. So I’m totally on board. what a yum yummy and mouth watering recipe that you provide. I will try to make this one too at home for my family and friends. Your description of the moist bread makes my mouth water! i just bought some almond meal this weekend for the first time, so i’ve been looking for some good recipes to use it with… this is perfect!! looks so good! This looks amazing!! Admittedly I don’t quite get the whole paleo thing either. Not that I think people are wrong for following it, I just am not sure I fully understand it. But I do understand that this bread is gluten-free and dairy-free and that makes me insanely happy :) bonus points for all the extra protein goodness! Looks so amazing, nicely done. caveman bread ha love it. ugh, paleo diet thoroughly annoys me for exactly that reason. And I really can’t get behind anything that doesn’t support fruit or greek yogurt. I need to get some coconut flour in my house so I can make this-I have everything else! The paleo diet doesn’t have a problem with fruit. I’m also curious about the paleo diet. Not enough to actually do it, but it certainly works for some people. Do you make your own almond flour or buy it? I need to get some of these staples in my pantry! I bought it the first time, but I just ran out making this recipe and ended up grinding my own. I used it in cookies yesterday and they turned out great. So much cheaper that way! The whole paleo thing confuses me too. But I’m all for experimenting, and I love seeing more recipes that use almond and coconut flour. Looks yummy! I kinda wanna go home and make this rightnow. But I still have half a pan (somehow!) of your protein bars in the fridge. And I totally love your baking/paleo points! I am not really into banana but this is one of the most exciting bread ever.. I want to give this a try..
I’ve been using coconut flour a little more too and really like it. I don’t really get the whole paleo diet either but like some aspects like the natural sweeteners. But some things I definitely couldn’t give up like beans! This bread looks fantastic! I’m definitely not on a paleo diet, but I love anything made with almond flour and coconut flour! I don’t like overly sweet breads, so this one sounds perfect! I would make it right now if my bananas were ripe. Anyone have the nutritional stats on this? I don’t have it Heidi, but you can easily plug it into a nutritional calculator (I use the one on Sparkpeople) to find out what you’re looking for. I love this! I’ve never heard of this Paleo diet, but it’s an interesting concept. The bread looks fabulous though, whether or not the cavemen could make it. I’ll definitely be trying this recipe! Hi may I know is it possible for me to substitute the almond and coconut flours with organic wholemeal wheat flour or all purpose flour? 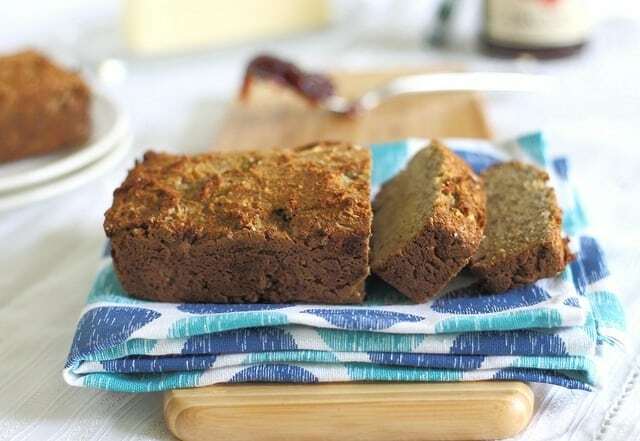 Why wouldn’t you just look up a regular banana bread recipe? This looks amazing! I got some almond flour and coconut flour but haven’t made anything with them yet. Now I know what I’ll be trying first! I don’t have any flax meal on hand… is there a sub? I have hemp seeds, but that doesn’t seem like it would be the best sub. If not, I’ll pick up some flax and try this asap! One other question: I don’t have mini loaf pans. What adjustments would you make if using a regular sized loaf pan? Thanks!!! Hi Tamara- sorry for the delayed response, this one slipped through the cracks! If using a regular loaf pan, it’ll just come out flatter. The baking time will probably be about the same but check it after 20-25 mins since it will be flatter. I haven’t made it with a regular loaf pan so you’ll have to do some experimenting. I hate how all the good really healthy recipes have bananas in them! I’m allergic but sometimes I just give up and make a recipe with them anyway. This one looks like it’s worth trying! Haha, I imagine if I was allergic to banana, I’d feel the same way. Sorry! It’s just the perfect sweetener without having to use sugar :) In lieu of you having an allergic reaction, maybe try pumpkin and add some more maple syrup? I love when recipes turn out, especially when they look like they’re going south. Like 50% of my diet is beans, I would never survive as a paleo caveman. This sounds delicious! You are so creative. I wish I could “whip things up” and have them turn out so yummy! My husband hates the taste of coconut oil, coconut amines and coconut milk, so I can’t used them. Does the coconut flour impart a coconutty flavor or is it pretty flavor-neutral? Also, a paleo lifestyle does not mean you eat like a caveman, just that you try to maximize the foods that were always available to humans, and minimize other foods. So many people are intolerant of gluten and grain, lactose or casein and processed foods; artificial sweeteners and sugar wreak havoc on our system; legumes (which I personally love) contain toxins that even our extensive soaking and boiling can’t get rid of. Think of it as a whole foods diet – lots of meat, fish, healthy fats, eggs and vegetables, and then fruit and nuts in moderation. Maple syrup is not 100% strict paleo, but no one follows only those restrictive guidelines all the time, and it’s better than many other sweeteners, so you’ll find it in many paleo “small cheat” recipes. Maggie thank you for giving some background on to what the paleo lifestyle is. I find it funny that people who know nothing about it are hating on it. It works for a reason. I just made this recipe into muffins and doubled the bananas and my kids loved them. Thanks for a great recipe. Do you mind if I blog about it giving you full credit for the recipe? Thanks! I don’t mind at all if you blog about it. I would prefer however, if you link to the recipe rather than writing it out fully. Glad you all liked it! Well, to answer my own question, the coconut flower does not impart any coconut flavor at all, thankfully for us. The bread was a great texture but did not taste like banana, imo. I think adding dried fruit or using more banana (less egg? I don’t know) might work for me. But once I put on some butter or jelly, it was pretty good. When you are avoiding grains, this would be a great stand-in. Sorry Maggie, I haven’t had much access to internet this weekend so I apologize for my delayed response. As you found out the flour is probably the least flavorful of the coconut “products”. I’m surprised you didn’t taste the banana in it. our was very much banana flavored, the two times I’ve made it so far. I think you could definitely increase the banana to 2 mashed and probably take out an egg for a more distinct flavor. Glad you liked the texture at least. Do you think I could use honey instead of maple syrup? I’m allergic to egg, and typically replace an egg with a banana or the egg replacer. Any idea if that would work? I honestly don’t know with this one because of how many eggs are in this recipe. If you try it, I wouldn’t do one or the other, I’d increase the bananas and do the egg replacer. Sorry, I’m just not sure and haven’t tested it without. Let me know if you do try it though, I’m curious to hear! I just wanted to comment on the paleo thing bc most people dont do the right kind of research and dont know any better, so here is my two cents…. The whole non grain idea is from what i understand for 2 reasons 1: phytate or phytic acid which pulls nutrients from our bodies, and that grains are all omega 6 there is no omega 3 . Now saying that, the phytic acid can be reduced in beans by soaking then so if you are going to eat beans soak them first. I am in the process of baking the bread looking good so far! Thanks for the recipe! I don’t know what I did wrong. Mine turned out really crumbly… maybe I used too much banana. I also used honey instead of maple. The banana makes it pretty sweet as is, and the honey just complements it well, as I’m sure maple syrup does. Due to medical reasons, I try to stay away from processed sugar or high sugar content in general (besides fruits). Real maple syrup clocks in at around 50g of sugar per serving and honey at around 16g of sugar. Distributed throughout the loaves, the sugar content would be significantly less, but the honey worked out just fine! So I took the crumbly banana bread and put butter and a little honey and some cinnamon on top and served it in a saucer of almond milk. Delicious! I’m surprised yours turned out crumbly b/c each time I’ve made it, it’s been far from a crumbly texture, but I’m glad you enjoyed it anyway! That sounds like a delicious breakfast or snack to me! Mine didn’t turn out well at all! I thought the batter was dry so I put extra banana in but it was still crumbly. It was also VERY baking soda-y, although I did only put in 1.5 tsp. I don’t know where I went wrong!! I made this today, and mine came out with a wonderful texture. Like you, though, I found it way too salty. I think next time I’ll try making it with a half teaspoon of salt, rather than a full teaspoon. Hi, I stumbled on this recipe while looking for a better coconut flour bread recipe. I like the addition of yummy almond flour, and moist bananas, AND that it doesn’t have the 1/2 stick of butter that the other recipes had. PS- Sam’s Club currently has 3 lb bags of almonds for $13 for those who want to make their own almond flour. I’m a Hunter-Gatherer Apprentice who recently started the Paleo Diet, I can confirm that your recipe is Paleo. The only non Paleo food would be the salt but since it is just 1 tablespoon this is fine. Great recipe that I will bake this weekend. Could you cook these in a muffin tin? Probably. I haven’t tried it though to tell you for sure. I just cooked this banana bread tonight as I am starting to eat Paleo tomorrow. For me it was quite dry but I think I over cooked it. I was thinking of adding another banana to the recipe and another Tablespoon of maple syrup. However, after a couple weeks of Paleo eating this bread will probably seem plenty sweet. I sliced the bread and put it in the freezer for a quick breakfast or snack. I will eat a slice tomorrow and serve it with sliced bananas on top to give it more moisture and banana flavor. Thanks for the recipe. Kerry- sorry it didn’t turn out for you. I’ve made this recipe as it’s stated 4 times now, each with incredibly moist results. In fact, any time I’ve cooked with coconut flour, it’s always turned out moist. I make an almond flour/coconut flour bake for breakfast usually 3 times a week and it’s moist. I really have no idea why it’s not coming out that way for you especially if you used all the eggs it calls for. Mine didn’t rise. Is it because I live in hot humid flat Florida? It’s not going to rise that much, mine did but just a little. That’s why it’s baked in mini loaves, so you don’t end up with a huge, flat loaf. The humidity might have something to do with it, but don’t expect it to rise like a normal loaf would. I made this recipe tonight and was so excited, but somehow it turned it out quite dry, actually crumbly. I’m no novice in the kitchen and I followed the recipe. Not sure what happened. I also think 2 bananas would’ve been better for sweetness and moisture. Thanks for the recipe! I made it into muffins last week, baked them at 350 for 20 minutes and they were perfect. 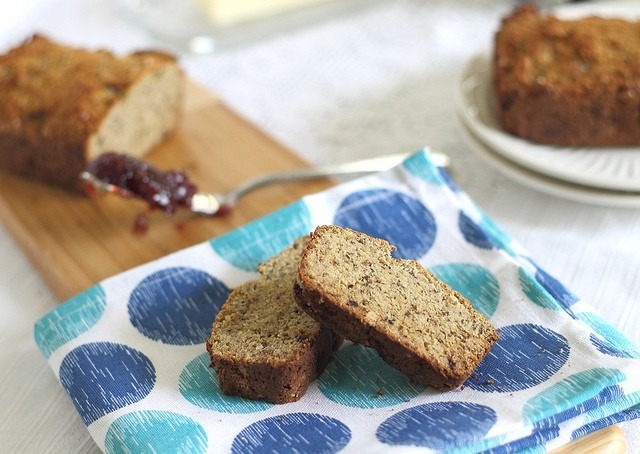 So happy to have banana bread back in our gluten/dairy free diet! Oops! Forgot to mention, I used 3 medium bananas and added 1 tbsp of coconut milk. I also made muffins. I used coconut granules as the sweetener. They were good but had a strong soda taste. I wonder if they would be ok with a little less baking soda? Loved this! I’m a dietitian and while I like the idea of the Paleo diet I had the same questions as you! I couldn’t justify eliminating beans and lentils for Bacon (processed meat)?!? So I make up my own rules, with aspects of paleo but mostly trying to eat clean. Maybe I’ll come up with a name for my “diet” one day! Any ideas!? I made this today and it mine turned out dry and not tasty at all, and I followed the recipe exactly. It definitely has too much of a soda/salty taste, and needs more moisture. I also made this… Very dry. I added some applesauce because i find covonut flour can be dry… I also added chocolate chips in one liaf. And raspberries and blueberries with cinnamon in another… Still dry but it added some dimension… Ill be going a different direction next time. Its great for people woth gf and sugar sensitivities!! After reading comments I used just 1 tp of baking soda and added an additional banana and a little extra coconut oil and maple syrup and it came out fantastic. Maybe add less coconut flour? This turned very bland and dry unfortunatley. I just finished eating two slices slathered in peanut butter! This turned out a lot better than I expected. My batter was really dry and slightly crumbly and I wasn’t sure how it would bake (bananas were small)! It did bake up nicely, though and the taste of bananas is perfect. Thanks so much for posting. I just finished eating two slices slathered in peanut butter! This turned out a lot better than I expected. My batter was really dry and slightly crumbly and I wasn’t sure how it would bake (bananas were small)! It did bake up nicely, though and the taste of bananas is perfect. I used Gourmet Imports fine almond flour. Thanks so much for posting. I made this bread today but i wouldn’t put any salt in it. …..i only used 1/2 teaspoon and i found it to be to salty. ….deginately no salt next time. …..